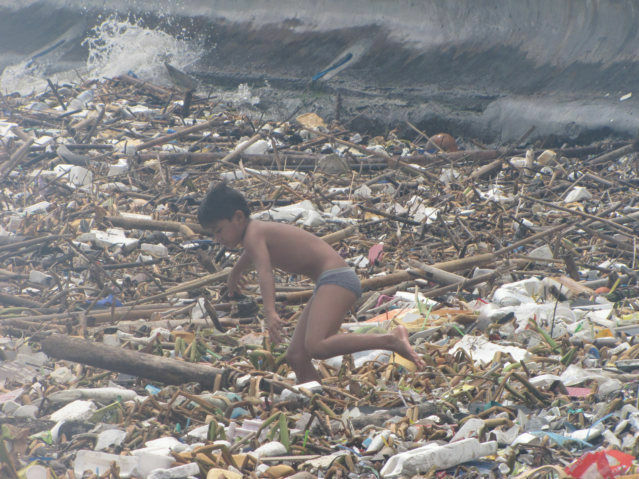 I found children walking on water in Manila Bay here in the Philippines. I took my morning walk Sunday, walking down towards the United States Embassy I came upon children walking on water. This photo was taken just to the left of the USA Embassy; in this area, trash has collected. 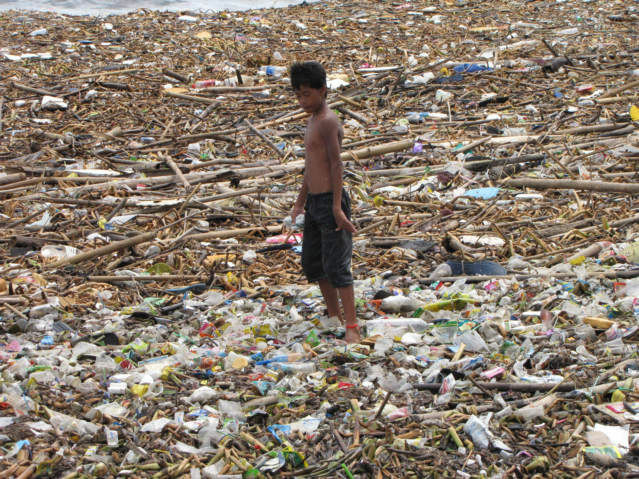 The floating trash is thick enough that small boys were able to walk on it. What is a Beachcomber? These children are searching for something, they are Beachcombers who took it one step further, and they are off the beach and walking on water. These two boys are working their way out to deeper water in search of some unknown treasure. As the boys would choose their steps, they would sometimes drop into softer spots. 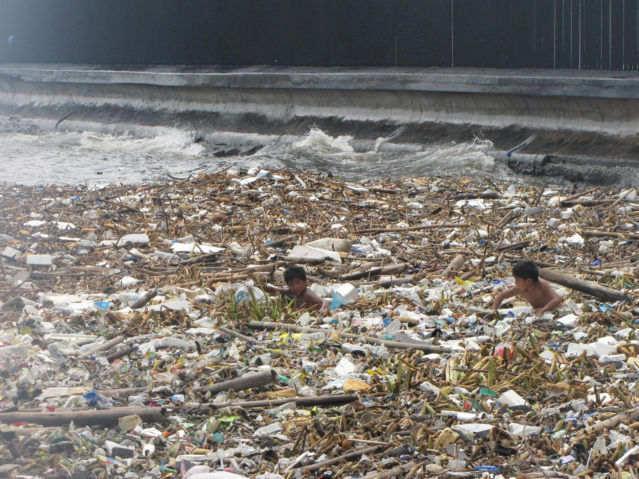 Two boy chest deep in floating trash in Manila, Bay Philippines. I took a video of this; however not sure if I want to put on YouTube.com, I took a video the last time I was in Manila of some street children walking around. A very small boy did not have on clothes, and YouTube.com pulled the video, I am not sure, reality of poverty is edited, so hard to get excited about doing the work. 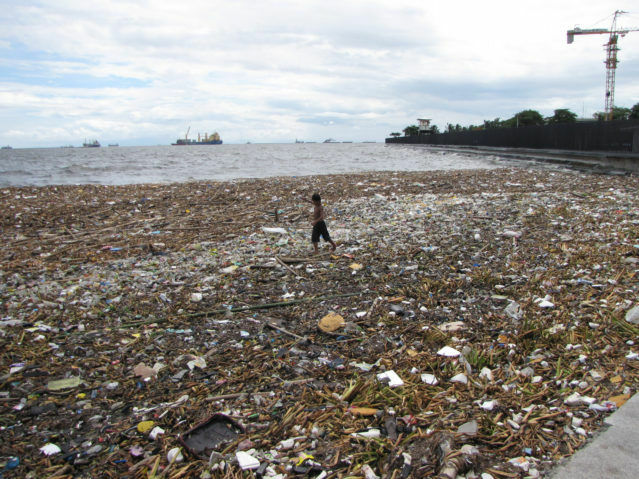 The contrast between a super motivated Philippines man riding his bike a great distance and a few boys walking in trash is the novelty of coming to the Philippines. A person can get whiplash by the sudden cultural differences, from one extreme to the next without a caution light. The is a nonchalant ability for the Philippines people to accept these situations as if they are 100 percent natural. I on the other hand try not to become jaded and also ignore them along with the groupthink. Street families or just squatter families is my opinion on how to describe these children, they all appeared to be associated with mothers and fathers. I see very few children without parents. The family is strong here in the Philippines, both a great thing and a horrible thing, the majority of girls in the area selling their bodies want money so they can send back to their families. I blame the family and the church for most of the prostitution in the Philippines. Social pressure is tremendous to earn money in any way possible. There is about 10 times the street children in Manila than any of the 16 Africa countries I have visited. The whole world migrates to large cities to live a horrible lifestyles, I think the desire for excitement of the city is an addiction. In the USA, people will spend 70-90 percent of their money to pay rent, just so they can live in New York City. These people always appear happy, hard for me to feel sad, I value happiness more than money. Breaks my heart to think people really live this way. I am positive some people would say it is good to grow up with what is called street smarts that it will make these kids strong. BUT my heart longs for children to be children in all ways and to enjoy the sunshine, trees, birds and all the gifts of life we have that has been bestowed on us. I think of my kids playing in a tree house they made, enjoying a game of ball, reading, catching turtles and having a good time on a picnic with a peanut butter sandwich with their dad and mom pushing them on a swing and catching them at the bottom of a slide. This is what a child needs to do to learn how to love and be loved, not these these really sad circumstances.